A Simple Web Based Employee Time Clock and Workforce Scheduler. 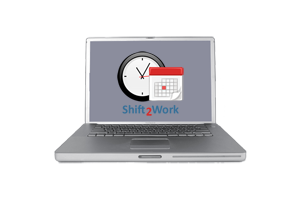 Our Shift 2 Work's web based employee time clock and scheduling program can be accessed through the internet while using any of your office PC or Mac computers. You don't need to purchase any special equipment or program. There is no software to upload or maintain. Restricting access to the program either by device or by IP address is easy and it will block employees accessing the clock in and out option outside the workplace. 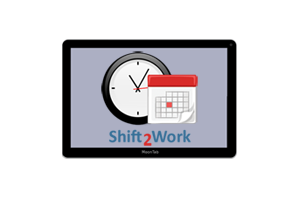 Shift 2 Work's employee time clock and workforce scheduling program is touchscreen and mobile device friendly so that employers and supervisors can easily use their tablet to view their staff's work schedules and online time cards. Our mobile app or browser login page is available for the quick clock in and out at worksite locations. If you don't have a smartphone, texting to clock in and out is also available. GPS tracking is available to ensure the location of the time punch. 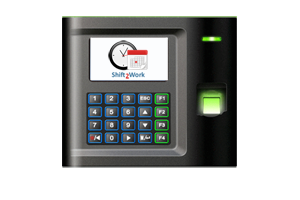 Our Shift2Work readers are preconfigured to connect directly to your web based time clock program using a network cable so the time punch is sent directly to your employee's time card in real time. No waiting or having to use a computer or USB drive to upload the time. Fingerprint Reader - If you are concerned about time card abuse or buddy punching, we recommend using our biometric fingerprint reader function. Employees cannot share their password or give their badge to someone else to clock them in or out. They have to be present to register their time punch. New optical sensor technology has improved to read fingerprints faster and better than ever before. Face Reader - The facial recognition reader is perfect for industrial, restaurant or custodial workers that may have worn fingerprints from working with chemicals or masonry or dirt. The reader camera will capture the facial image and instantly record the time punch to clock in and out into the employee's web based time card in real time. Badge Reader - Employees can quickly clock in and out when using a key fob style or credit card style badge. The employee just places the badge close to the card sensor to register the time punch then the reader will send the time punch to the employee's time card online and vocalize when the time punch is recorded. ➮ AHA and DCAA compliant to meet labor law requirements. 'Thank you Steve and Wendy. Shift2Work is highly recommended by our clients. 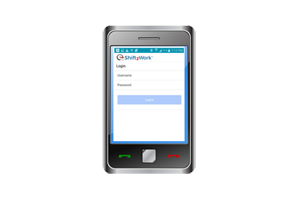 'I’m very satisfied with Shift 2 Work and find it easy to use.